What would it be like to lose your youngest child to a serial killer? And then to have God invite you out for a conversation at the very shack where the terrible deed took place? And then imagine that the door to that shack of horrors opened . . . and before you knew it you had been swept up in the motherly embrace of a large African American woman? This most unlikely of stories, as told in William Young's The Shack, has become a runaway bestseller and it is easy to see why. But even as lives have been transformed through this book, other readers have sternly denounced it as a hodgepodge of serious theological error, even heresy. With one pastor urging his congregation to read it and another forbidding his congregation to, many Christians have simply been left confused. Aware both of the excitement and uncertainty generated by The Shack, theologian Randal Rauser takes the reader on a fascinating journey through the pages of the story. In successive chapters he explores many of the book's complex and controversial issues. Thus he explains why God the Father is revealed as an African American woman, he defends the book's theology of the Trinity against charges of heresy and he considers its provocative denial of a Trinitarian hierarchy. But at its heart The Shack is a response to evil and so Rauser spends the final three chapters considering the book's explanation for why God allows evil, how the atoning work of Christ offers new hope for a suffering world and ultimately how this hope extends to all of creation. 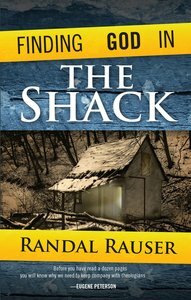 Through these chapters Rauser offers an honest and illuminating discussion which opens up a new depth to the conversation while providing the reader with new opportunities for Finding God in The Shack. About "Finding God in the Shack"
Randal Rauser (Ph.D., King's College, London) is Associate Professor of Historical Theology at Taylor Seminary, Edmonton. Dr. Rauser's passions include that of developing a biblically sound apologetic theology that meets the challenges of secular western culture. He is a popular speaker and gifted communicator who seeks to bring the truth of Scripture to bear on the real-life issues of today. Dr. Rauser is the co-author (with Daniel Hill) of Christian Philosophy A-Z (Edinburgh University Press, and author of Faith Lacking Understanding (Paternoster); Finding God in the Shack (Paternoster) and Theology in Search of Foundations (Oxford University Press).